It is safe to say that it has been raining cats and dogs in Nashville so far this week. I absolutely love a rainy day when I am able to stay in, pop some popcorn, watch a great movie or read a book, and just curl up under a cozy blanket and listen to the rain fall. Most days it seems like there is always something that needs to be done or somewhere to be rain or shine! On those terribly rainy days I always break out my favorite pair of rain boots and grab an umbrella on the way out the day, after all, who wants to be cold, wet, and stuck with a bad hair day. 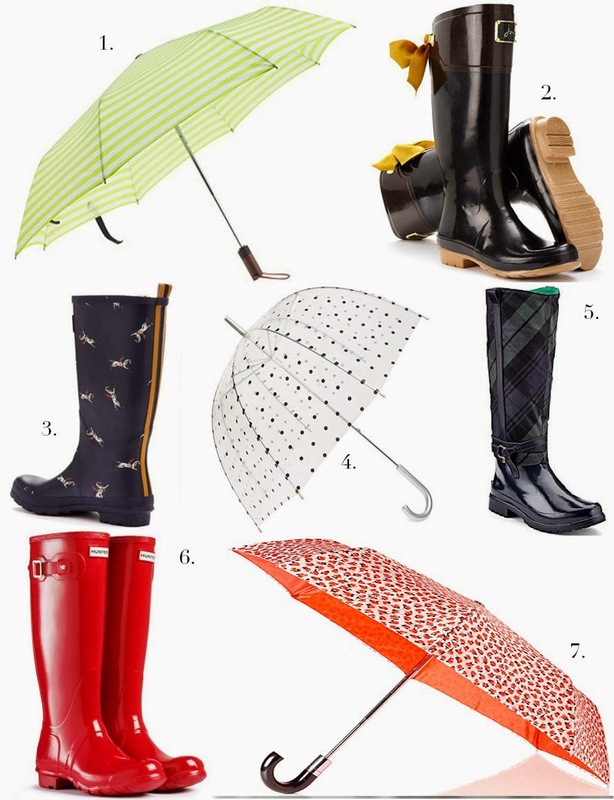 Above are a few of my favorite umbrellas and rain boots to survive the rainy day and of course maintain a good hair day! Here’s where to shop for my above rainy day picks. Click on the name of the item to be directed to the website. Hope the weather clears up soon, but I love your picks! Thanks :) Happy to hear you enjoyed this post! I love the rain! Everything is so peaceful right after it stops. Inclement weather always has the cutest fashion! I do love how green everything is after it rains! We're rainy too. Such a bad week for rain. I need a fun umbrella. A fun umbrella always makes a rainy day better! I really like those red hunter rain boots as well! I love the horse print on those! Cold and rainy here to I had my trusty leopard rain hat on.. 47 degrees!! Hello its suppose to be Spring! I hope the sun comes out and that it warms up where you are very soon! Beautiful rain boots and umbrellas! I know it's been rainy here too, and you always gotta be somewhere and it's not fun to be staying in all the time. It's supposed to rain everyday this week so this post will come in handy for me. Cute umbrellas definitely add some sunshine to a rainy day. I have to say even though I don't like getting out in the rain I do love the rainy apparel! Glad to hear you enjoyed this post! It is such a rainy week here. April showers bring May flowers! This makes me think I could use a cute umbrella. If I venture out in the rain, rain boots & umbrella & rain coat are always necessary! When it rains, it FLOODS in Charleston. Cute rain gear. If you still want to guest post, let me know! Thanks! Glad to hear you enjoyed this post! I'll send you an email later on! oh i think i've fallen in love with the red rubber boots! so chic! I love those red Hunter boots!